Some thoughts deserve to be framed. “Mission Statements” collect many clever quotes and points to ponder, inspire or amuse, and tailor them to the Arts & Crafts home. Anyone with a passion for cats, dogs, kids, books, friends, home, faith or gardening is bound to find at least one wall-worthy Mission Statement. 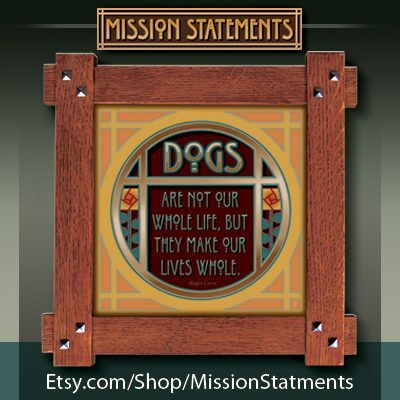 Each is beautifully rendered, digitally printed on canvas, mounted on board, and presented in a solid oak, Mission-style frame handcrafted in Pennsylvania.